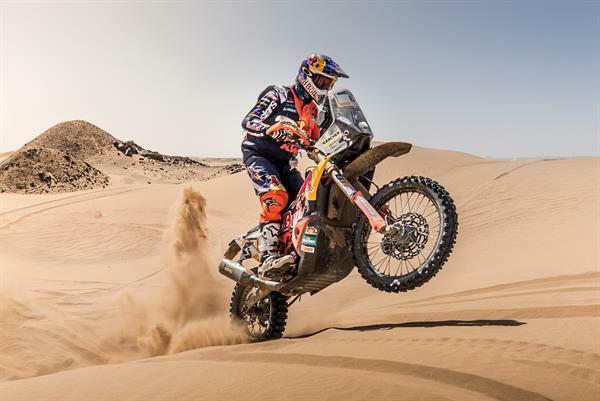 Red Bull KTM Factory Racing’s Toby Price has successfully completed the technically demanding first stage of the 2018 Merzouga Rally in seventh position. Team-mate Laia Sanz brought her KTM 450 RALLY home in 18th place. Day one of the 2018 Merzouga Rally proved to be as tricky to navigate as the teams had imagined. With the stage comprised of two loops, riders would first tackle a 110km circuit in the desert to the west of Merzouga before completing a shorter 96km loop in the same location. Setting off at around 8am this morning competitors went straight into the 216.71km timed special. Complicated navigation and a route that incorporated a section shared between both loops would prove very tricky for all riders to successfully complete without mistakes. With the terrain comprising of a mixture of deep sand dunes and faster hard-packed tracks, there were many challenges for all throughout the course of the day. Toby Price, following his runner-up position from Sunday’s Prologue, set off 14th from the bivouac in the morning. Keeping to a good pace, the 2016 Dakar champion trailed the leaders by only a couple of minutes at the halfway stage. Unfortunately, after missing a checkpoint, Price lost some valuable minutes and eventually completed the stage in seventh position, just less than 16-minutes behind the leader. It was a tough day in the desert for Laia Sanz who also lost time while trying to find a checkpoint. The Spaniard was still positive about her performance however and hopes to claw back some time over the remainder of the rally. Stage two of the 2018 Merzouga Rally sees riders cover a 175.3km special stage again comprising a mixture of sand dunes and faster tracks later in the day. This entry was posted in Adventure, Global News, Moto, Motorsports, Offroad by admin. Bookmark the permalink.